One of Germany’s hottest exports, Moguai, recently dropped his second artist album “Mpire” on deadmau5 label mau5trap. He is touring around the world almost non stop and in the last couple of years his name really has become pretty big in the industry and therefore we thought it would be ace feature him in an interview! 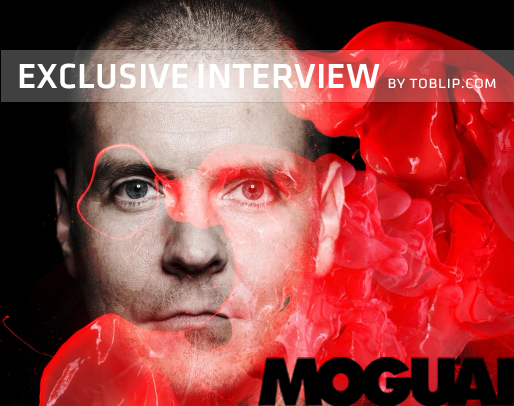 toblip.com: Hey Moguai, thanks a lot for doing this interview. You are into music for a long time and of course a lot of people do know you, but please introduce yourself for those who don’t know you yet. Moguai: My name is André Tegeler, currently living in Recklinghausen / Germany but will move to Berlin in the near future. I dj and produce music since the early nineties, and have released my second artist album this January. toblip.com: You have been doing a lot of things in your career and after some ace releases like “Nyce/Blau” or “Oyster” on mau5trap you released your first album “We R Lvye” on Deadmau5 label. How was it to release tracks and the album on deadmau5 label for you as he has become a really big name in the industry? Moguai: For me and my music it´s fantastic! The team behind this label is doing a really great job, and the whole world puts a focus on this label, so you are guaranteed the most possible exposure. After years of making music I decided to make a cut a few years ago, relocating the studio into my cellar, and to start from scratch. For the music I produced then, mau5trap was the only musical platform that would put the music into the right context, and of course it was not only the first choice, but the only one, when it came to my debut album. toblip.com: Let’s talk about your album “Mpire”. The sametitled single is out since the 16th January and the whole album are out now and in our opinion very very good. What do you think about your album and how would you describe it? toblip.com: We noticed that you have been on tour almost non-stop around Christmas and after a few days off you are doing a tour in the US to promote your album/sound. How do you think about the US market and if there is a difference what is it between the US and the European crowd? Moguai: Haha, I get asked this question almost in every interview, but yes, there is a difference between the US and Europe. For me it feels like the US & Canada have that vibe and enthusiasm for EDM now, we had in Europe in the middle of the nineties, when everything was new and fresh for us. The people there are very openminded there, I always give this example, but it describes the spirit there pretty good: It´s not a big deal in the States when Skrillex plays on the main stage of a huge festival right after Armin van Buuren, that wouldn´t be possible in Europe where most people think in categories. toblip.com: Besides the tour you now have your own radio show on Sirius XM and you are back on 1 Live as far as I know. Do you make differences between both shows when it comes to the sound? Moguai: The show at Sirius XM was a special feature. The guys there heard about my second album and asked me if I would be interested in a 4 show special leading towards the album. I had great feedback on this feature, and maybe there will be a regular show on Sirius XM someday.. who knows ;) But you are right with the 1LIVE show, the concept has slightly changed at the beginning of the year. Now I´m the host for 60min every week, playing from 00-01 AM, and then having guestmixes from the likes of Digitalism or Avicii. toblip.com: The progress of Electronic Dance Music is really huge, especially in the US. How do you think about that and where will house be in like 5 years? Will it still be that hyped or do you think that there will be a depression? toblip.com: You are still doing a lot of gigs in Germany but it seems that the big names can’t be paid by the promoters anymore. How you do you think about that? Moguai: Germany is a difficult market for EDM, because compared to other countries, people are used to it for several decades now. But I think that the public awareness of EDM changes right now from being a “DJ Thing” in small Clubs to a big “Concert Thing” on Festivals, so you´ll possibly hear more international big names here in the future as well. toblip.com: You seem to be pretty open for new equipment and set solutions. We’ve seen you playing with 2 iPads when beatport streamed your set from their Berlin office. What gear is – in your opinion – the best to play a set. Moguai: It really depends on what you want, or what you feel comfortable with. Pioneer and Native Instruments are producing incredible products, but the possibilities are almost endless, and can be adjusted to your needs. For me right now it´s playing with the two iPads controlling Ableton Live on my Laptop, but this might change in the future as well. The technical progress is crazy in these days. toblip.com: Talking about equipment. What kind of software and hardware do you use for productions/which do you think are necessary for your work? Moguai: When I started to play my shows with Ableton Live, I switched from Logic to Live in the studio as well… which made more sense for me, but like the DJ gear it depends on your own workflow, and needs. So it´s Ableton Live as the DAW, and as VSTs I often use the Sylenth1, NI Massive and NI Maschine. toblip.com: What kind of influences do you have and what are your goals when you are producing a track? Moguai: I usually don´t have a certain goal in mind when I start a track. Sometimes it starts with a melody, or a beat, sometimes it´s just a sound or vocal chop. toblip.com: Of course your career will not end fast and we wish you a lot of success with your upcoming album but what are your plans after your career? toblip.com: What are your recent Top 5 and your all time classics?